The brachial plexus is formed by the four lower cervical spinal nerves and the first thoracic spinal nerve. 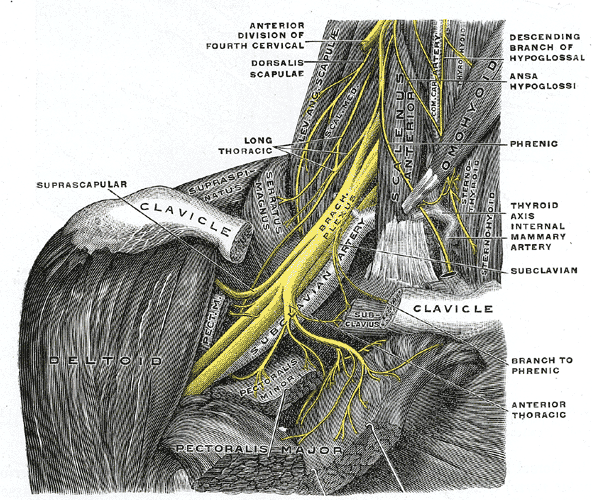 The nerve bundles of the brachial plexus pass through the cervico-axillary canal to serve the axilla (armpit), brachium (arm), antebrachium (forearm), and hand. The brachial plexus provides cutaneous (skin) and muscular innervations for the upper limbs, excluding the trapezius muscle and an area of skin near the axilla that are innervated by the spinal accessory nerve and the intercostobrachial nerve, respectively. The brachial plexus is divided into roots, trunks, divisions, cords, and branches. spinal accessory nerve: A nerve that controls specific muscles of the shoulder and neck. axilla: The armpit, or the cavity beneath the junction of the arm and shoulder. Right brachial plexus: The right brachial plexus with its short branches, viewed from the front. The brachial plexus is a network of nerve fibers that run from the spine that are formed by the ventral rami of the lower four cervical and first thoracic nerve roots (C5–C8, T1). The brachial plexus proceeds through the neck, the axilla (armpit region), and into the arm. It is a collection of nerves passing through the cervico-axillary canal to reach the axilla and innervate the brachium, the antebrachium, and the hand. The brachial plexus is responsible for cutaneous and muscular innervation of the entire upper limb, with two exceptions: the trapezius muscle is innervated by the spinal accessory nerve (CN XI) and an area of skin near the axilla is innervated by the intercostobrachial nerve. Lesions on the brachial plexus can lead to severe functional impairment. Five roots: The five anterior rami of the spinal nerves, after they have given off their segmental supply to the muscles of the neck. These roots merge to form three trunks: The superior or upper (C5–C6), the middle (C7), and the inferior or lower (C8, T1). Each trunk then splits in two, to form six divisions: The anterior divisions of the upper, middle, and lower trunks and the posterior divisions of the upper, middle, and lower trunks. The posterior cord is formed from the three posterior divisions of the trunks (C5–C8,T1). The lateral cord is the anterior divisions from the upper and middle trunks (C5–C7). The medial cord is simply a continuation of the anterior division of the lower trunk (C8, T1). Most branches branch from the cords, but a few branch directly from earlier structures. The five on the left are considered terminal branches. Brachial plexus: Diagram of the brachial plexus and its branches.